So you have a passion for continuing to play your sport at the collegiate level. 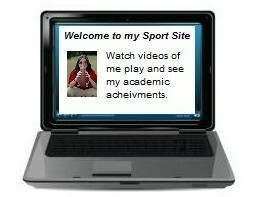 It's more than just practicing your sport hours on end until mom is yelling at you it's time to come in to do homework. It's just as important to know how to market yourself to the school you want to play at. Here's some helpful links and information that will help you take it to the next level. Below is the registration link you need to follow to play a sport at the colligate level. High School Athletes needto register ASAP. There is a fee to register with the NCAA. Once you register you need to make an appointment with your guidance counselor. Learn what it takes to be a D-1 or D2 NCAA prospect. Below are PDF's regarding what you need to begin marketing yourself to Universities and Colleges. Have a website professionally created for your player that coaches can visit & see videos of play, bio information, school grades, achievements and more. It's the ultimate athlete marketing tool. This is a free service to Southington Athletes. Click here for promo code. Visit Captain U a great recruiting website & player marketing tool. Approved by college coaches. The site has free functions as well as advanced features for a small fee. It will make the process easy and keep you organized.